Figure 1. Evolution of absolute thermal noise levels as represented by equivalent input-referred noise resistance Rn in scientific publications. The state-of-the-art envelopes for ∆-∑ modulator (o) and Nyquist (#) ADCs have been highlighted. Quantization errors, thermal noise, flicker noise, switching transients and sampling jitter all contribute to the noise power observed at the ADC output. In order to enable a deeper analysis of noise performance, it is desirable to separate different contributors from each other. A first step is to separate ideal quantization errors inherent to the algorithm from actual circuit noise. Any noise above the ideal quantization noise level is due to the actual circuit implementation, and is referred to as “circuit noise” in this treatment. It originates from both analog and digital circuits, and can be further subdivided as described in the following subsections and upcoming posts. Using (1) for SNRQ, the signal-to-circuit-noise ratio (SNRC) is estimated by noise power subtraction based on reported signal-to-noise ratio (SNR) and resolution N as described by (2). Since SNR and N were simultaneously reported in only 22% of all publications, SNR was used instead of SNRC when N was not available, and the signal-to-noise-and-distortion ratio (SNDR) was used as a conservative estimate of SNR when the latter was not explicitly reported. Using these conservative approximations, 86% of all reported ADCs could be assigned an SNRC estimate. Although (2) gives a better view of circuit noise, some caution needs to be exercised when the reported SNR is very close to the ideal quantization noise. In such a case the subtraction in (2) becomes numerically unsound, and small rounding errors can have great impact on the estimated SNRC. The effects of flicker noise  can be suppressed by chopper techniques  or the use of correlated double sampling -. Very few ADC publications report flicker noise performance explicitly, and in many wide-band applications the flicker noise is not of particular concern. Thus it is not included in this study. On-chip switching noise result from transients caused by the switching of analog and digital circuits during normal operation. Such interference propagates as transients on power supply lines, through the substrate, or by inductive and capacitive coupling. Its effect can be suppressed using supply separation, decoupling, guard-rings, electromagnetic shielding, and by controlling the slope or timing of dominating transients such as those generated by digital output pins. In a large circuit with many simultaneously switching elements, any deterministic relations between input signal and on-chip state changes are likely to be obscured by the large amount of switching nodes. Switching interference is then observed as an increased total noise level, possibly indistinguishable from thermal noise. Switching noise is usually not reported explicitly in ADC publications, and is difficult to estimate from other data typically reported. Therefore it is not treated in this survey. Due to component mismatch, real ADC implementations have finite (non-zero) differential non-linearity (DNL) errors. Such DNL errors cause a non-uniform distribution of decision levels that increase the quantization error power above that of the ideal quantizer described by (1). The exact amount of additional noise depends non-trivially on the magnitude and distribution of DNL errors across the converter code range, and not only on the worst-case DNL error normally reported. Furthermore, because of the difficulty to define a “typical” DNL error magnitude that would correctly represent the entire gamut of ADC implementations surveyed, “DNL-noise” is not included in the treatment. Equation (4) defines a theoretical limit on the achievable SNR for an ADC with a given input swing and impedance level. Assuming fixed values of T and VFS, the theoretical limits for different Rn can be added to SNR or effective number-of-bits (ENOB) vs. fs plots of reported experimental data as a visual guide, e.g., as done by Walden . In a future Converter Passion post, I actually plan to do something similar with our own survey data. It should be noted, however, that VFS vary between 5 mV  and 20 V  in the present survey. This corresponds to a 72 dB variation in (4), and simply assuming a fixed VFS therefore gives a very coarse approximation of Rn. Hence the reported values of VFS were also accounted for in this treatment. It was additionally compensated for the fact that ideal quantization noise is not contributing to the thermal noise, and Rn was therefore estimated from the estimated circuit noise rather than the total noise, as described by (5). As far as the blogger is aware, this compensation for quantization noise and full-scale range (FSR) was not applied in any other ADC survey when estimating thermal noise performance from empirical data. The evolution of Rn over time is shown in Fig. 1 for an assumed T = 300K, and the state-of-the-art envelope for delta-sigma modulator (DSM) and Nyquist ADCs are highlighted. As explained above, the value of Rn reflects the absolute noise present in the circuit with ideal quantization errors removed. The lowest absolute noise level reported for ∆-∑ modulators to this date is equivalent to Rn ≈ 2.5 kΩ for the DC measurement ADC in  by Thomsen et al., and the best Nyquist converter is the 250 MS/s, IF-sampling, 16-b, pipeline ADC by Ali et al. with Rn ≈ 6.2 kΩ. Note that the estimation of SNRC in (2) and (5) becomes sensitive to numerical errors when the reported SNR is close to the ideal quantization noise limit. In order to not overestimate the flatness of the saturation/slowdown region, three designs - were treated as potential (but not certain) outliers, possibly created by numerical problems in the estimation of SNRC, and therefore the main state-of-the-art envelope was drawn inside of these designs. As an example, a peak ENOB of ~7.97-b is reported for the 8-b folding ADC design by van Valburg et al. . It corresponds to an ADC with almost nothing but ideal quantization noise, and hence a design that has extremely low analog noise levels in comparison with its overall spec. The same applies to the designs by van de Plassche et al. and Garuts et al. . For completeness, the Rn values estimated for these designs have been added to Fig. 1, together with the alternative state-of-the-art bound resulting from their inclusion. It is further seen from Fig. 1 that absolute noise levels have not improved after year 2000 for delta-sigma modulators, and only improved by less than 3× since the 17 kΩ achieved in 1997  for Nyquist ADCs. From what is seen in Fig. 1, it is highly likely that absolute noise power performance is currently in a state of saturation, or significant slowdown, where only moderate improvements are reported over time. Observing how Rn evolves over technology scaling, as shown in Fig. 2, gives further reason to believe in such saturation. It seems that the state-of-the-art Rn is almost independent of technology node, which is in line with , where it is suggested that the absolute noise in devices may remain constant over scaling. Similar trends of saturation will be shown for other noise-related performance parameters in two upcoming posts. In the next post we will examine the evolution of A/D-converter jitter performance. Figure 2. 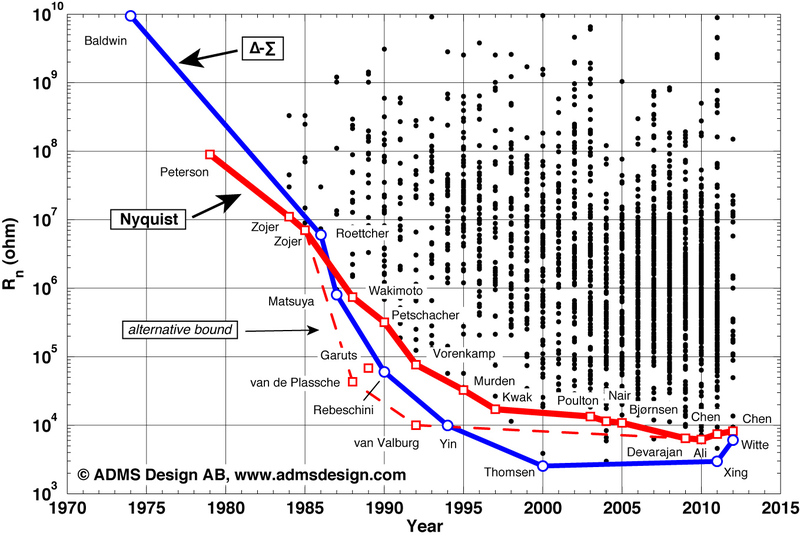 Evolution of equivalent input-referred noise resistance Rn over node geometry (any technology) according to scientific publications. The state-of-the-art envelopes for ∆-∑ modulator (o) and Nyquist (#) ADCs have been highlighted. Please note that what we believe to be Australia’s first – the 20 MHz bandwidth, LC bandpass delta-sigma ADC in 40 nm CMOS by Harrison et al. – is also one of the ADCs currently defining the state-of-the-art envelope for Rn vs. node scaling. Now, doesn’t that seem like a good way to introduce yourself? I think so. 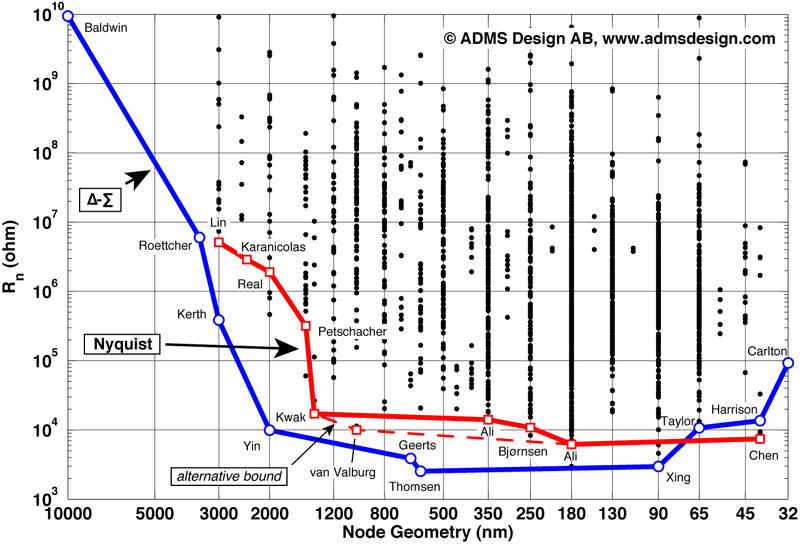 The apparent increase in Rn below 90 nm is not necessarily due to physics: There are too few designs below 65 nm to assess these nodes. In particular, the effort by Carlton et al. is the only 32 nm ADC so far. The higher Rn in 65 nm can be a temporary setback (as also observed for 130 nm). It should be understood that the Rn values in this post are estimates of thermal noise under the assumption that the remaining noise is dominated by thermal noise (at low input frequencies) when quantization noise is removed. For the designs with state-of-the-art noise performance, this is a reasonable assumption. Survey data used in this post has a near-exhaustive coverage of all scientifically published ADCs, but did not include commercial parts. It is sometimes suggested that the inclusion of commercial parts would paint a completely different picture. At least when it comes to noise-related performance, they don’t seem to do that. Although commercial parts may settle to a slightly different (usually better) noise-level, they show a similar slow-down and saturation behavior over time. The term “Node Geometry” used in Fig. 2, indicates a more liberal inclusion of all survey data points for which a process technology “feature size” was reported. In contrast, the more discriminating “Channel Length” is sometimes used in other posts. I’m happy that WordPress doesn’t apply a mandatory page fee for oversized blog posts 😉 … maybe they should. H. Pan and A. Abidi, “Spectral spurs due to quantization in Nyquist ADCs,” IEEE Trans. Circuits and Systems, pt. I, vol. 51, no. 8, pp. 1422–1439, Aug. 2004. M. S. Oude Alink, A. B. J. Kokkeler, E. A. M. Klumperink, K. C. Rovers, G. J. M. Smit and B. Nauta, “Spurious-free dynamic range of a uniform quantizer,” IEEE Trans. Circuits and Systems, pt. II, vol. 56, no. 6, pp. 434–438, June 2009. C. D. Motchenbacher, and J. A. Conelly, Low noise electronic system design, Wiley, 1993. B. P. Del Signore, D. A. Kerth, N. S. Sooch, and E. J. Swanson, “A monolithic 20-b delta–sigma A/D converter,” IEEE J. Solid-State Circuits, Vol. 25, pp. 1311–1317, Dec., 1990. D. Reynolds, and S. Ho, “An integrated 12 bit analog front end for CCD based image processing applications,” Symp. VLSI Circ. Digest of Technical Papers, Honolulu, USA, pp. 96–97, June, 1996. K. Philips, P. A. C. M. Nuijten, R. Roovers, F. Munoz, M. Tejero, and A. Torralba, “A 2mW 89dB DR continuous-time ΣΔ ADC with increased immunity to wide-band interferers,” Proc. of IEEE Solid-State Circ. Conf. (ISSCC), San Francisco, California, pp. 86–87, Feb., 2004. A. Thomsen, E. de Angel, S. X. Wu, A. Amar, L. Wang, and W. Lee, “A DC measurement IC with 130nVpp noise in 10Hz,” Proc. of IEEE Solid-State Circ. Conf. (ISSCC), San Francisco, California, pp. 334–335, Feb., 2000. A. M. A. Ali, A. Morgan, C. Dillon, G. Patterson, S. Puckett, P. Bhorashkar, H. Dinc, M. Hensley, R. Stop, S. Bardsley, D. Lattimore, J. Bray, C. Speir, and R. Sneed, “A 16-bit 250-MS/s IF Sampling Pipelined ADC With Background Calibration,” IEEE J. Solid-State Circuits, Vol. 45, pp. 2602-2612, Dec., 2010. J. van Valburg, and R. J. van de Plassche, “An 8-b 650-MHz Folding ADC,” IEEE J. Solid-State Circuits, Vol. 27, pp. 1662-1666, Dec., 1992. R. J. van de Plassche, and P. Baltus, “An 8-bit 100-MHz Full-Nyquist Analog-to-Digital Converter,” IEEE J. Solid-State Circuits, Vol. 23, pp. 1334-1344, Dec., 1988. V. E. Garuts, Y.-C. S. Yu, E. O. Traa, and T. Yamaguchi, “A Dual 4-bit 2-Gs/s Full Nyquist Analog-to-Digital Converter Using a 70-ps Silicon Bipolar Technology with Borosenic–Poly Process and Coupling-Base Implant,” IEEE J. Solid-State Circuits, Vol. 24, pp. 216-222, Apr., 1989. S.-U. Kwak, B.-S. Song, and K. Bacrania, “A 15-b, 5-Msample/s Low-Spurious CMOS ADC,” IEEE J. Solid-State Circuits, Vol. 32, pp. 1866-1875, Dec., 1997. W. Sansen, “Analog design challenges in nanometer CMOS technologies,” Proc. of IEEE Asian Solid-State Circ. Conf. (ASSCC), Jeju, Korea, pp. 5–9, Nov., 2007. J. Harrison, M. Nesselroth, R. Mamuad, A. Behzad, A. Adams, and S. Avery, “An LC Bandpass ΔΣ ADC with 70dB SNDR Over 20MHz Bandwidth Using CMOS DACs,” Proc. of IEEE Solid-State Circ. Conf. (ISSCC), San Francisco, California, pp. 146–147, Feb., 2012. B. R. Carlton, H. Lakdawala, E. Alpman, J. Rizk, Y. W. Li, B. Perez-Esparza, V. Rivera, C. F. Nieva, E. Gordon, P. Hackney, C.-H. Jan, I. A. Young, and K. Soumyanath, “A 32nm, 1.05V, BIST enabled, 10-40MHz, 11-9 bit, 0.13mm2 digitized integrator MASH ΔΣ ADC,” Symp. VLSI Circ. Digest of Technical Papers, Kyoto, Japan, pp. 36–37, June, 2011. This entry was posted in ADC survey, Research and tagged A/D-converter, ADC, analog-to-digital converter, linkedin, noise, performance, scientific, state-of-the-art, survey, thermal noise, trends. Bookmark the permalink.